Are you a teacher or teaching assistant based in the North East? Premier Teachers would love to hear from you. If you are a current Premier Teacher, please visit our teacher resources page where you will be able to download a timesheet and find other useful resources to help you through the week. Our team puts a real focus on working with you as an individual, whether you are a teacher, a teaching assistant/HLTA or any other roles in a school, college or an academy. We want to understand your mix of skills, experience and personality so you can make a positive impact from day one in an environment where you can thrive. We wish to make a lasting partnership with you so we can hone your skills through CPD and to continue to work with you as you move up the career ladder to more senior roles. 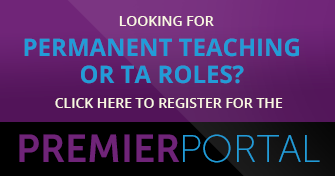 If you are a teacher in Sunderland, Newcastle, Stockton or anywhere in the North East and are interested in registering with Premier Teachers, please complete the form below and send us a CV - we'll get back in touch to organise a time to meet! And for all of you, you can of course contact us if you have a question that you can't find on the website or just want to hear a friendly voice!